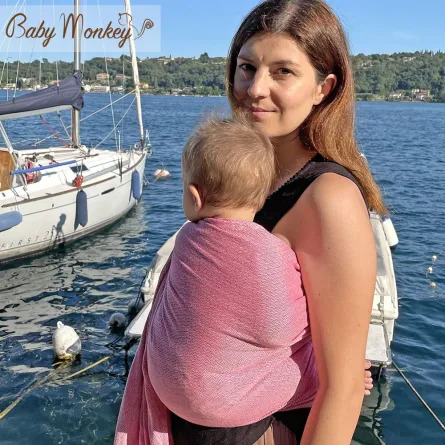 Available in different sizes, all BabyMonkey slings have a diagonal twist of the fabric and a 67cm width, allowing you to surround your baby in the best way. The diagonal weft inverted in the middle is a unique and innovative feature of BabyMonkey which improves the symmetry of the sling, allowing a perfect distribution of the baby’s weight. Soft, comfortable and robust, they are suitable for both newborn babies and older/heavier children. 100% made of natural fibres, they are characterized by jacquard decorated patterns. Discover all the details of BabyMonkey woven wraps. Discover all the details of BabyMonkey ring slings.